We are bringing an exciting Circus to town. We work together as a team to give the audience the best show we can. This game was inspired by the world famous Cirque du Soleil that features magnificent, daring performances by human beings as well as wonderful humor and skills by Clowns. Animals are included in this game, but since it is your Circus, you can put on your own show with or without them. Each player spins to see what moves are to be made. Maybe you move the Acrobat along the spotlight spaces. Or maybe the High Wire artist. Or maybe danger looms on the Trapeze and a Safety Net is needed. Can we guide the Performers from Start to Finish without taking a Fall? The risks are great, the moves tricky. The results are very satisfying. 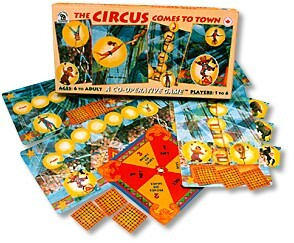 Includes: 4 boards, each 6 x 12", illustrating special circus performances; set of cards depicting safety nets, clown acts, animal acts, and main performers; ringmaster's spinner; rules for regular and hard games.